On the 29th & 30th June, four of Europe's best amateur American Football clubs will battle it out to win the title of Western European Champion in the 2013 Atlantic Cup. This is the fifth year of the Championships which this year is being hosted by the Irish American Football Association (IAFA). IAFA is also proud to host these Championships as part of The Gathering Dublin in association with South Dublin County Council and South Dublin Tourism. 12:00 Amersfoort Untouchables (NL) v Belfast Trojans (IAFL). 15:30 Trinity College Dublin (IAFL) v Brussels Tigers (Bel). This is the 5th edition of the annual tournament, which is the official European Championship for purely amateur teams in Western Europe. 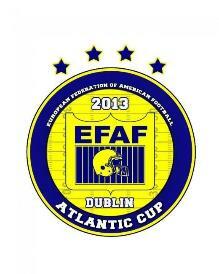 For the first time ever, the event will feature two teams from the IAFA. Northern Ireland’s Belfast Trojans secured their entry by winning the Shamrock Bowl, which is Ireland’s all-island National Championship in 2012. They are 8-0 so far in 2013. The team was unbeaten in 2012. Amersfoort Untouchables finished last season with an impressive 8-3 record overall in the Dutch league. The team enters the tournament with the added pressure of having to defend the title on behalf of the Netherlands American football federation – Lelystad Commanders won last year. Brussels Tigers are the dominant team in Belgium right now. They gained entry to the tournament with an impressive 46-6 victory over Antwerp Diamonds in last years Belgian Bowl. They won the Belgian Bowl again earlier this month. Trinity College Dublin is one of the rising stars of the IAFL. The team has the best record of the six SBC teams based south of the border and is leading SBC South with a 7-2 record. The team adds some local interest to the tournament. All the games are being played in Tallaght Stadium, a modern 8,000 capacity stadium that has hosted Champions League and Europa League soccer games. This is an all-ticket event, however, as it is part of The Gathering Dublin, tickets are free of charge to open the event up to as many people from around Ireland and Europe as possible. www.eventbrite.ie/event/7065736809/22100 or the IAFA Facebook page at www.facebook.com/iafaireland.